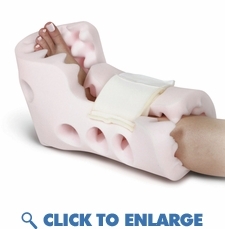 This convoluted foam boot is made with medical grade foam and suspends the heel to reduce pressure. The foam boot is designed with ventilation holes to prevent heat build up. Constructed with hook-and-loop closure for easy adjustment. Removable foam block included to increase heel suspension.